The post-70’s explosion of independent music in America has many traceable roots, each with a compelling story. Drawing on never-before-seen archival footage, in-depth-interviews with musicians and producers, and a mighty soundtrack, THE SMART STUDIOS STORY reveals the pivotal Midwest link to the global rise of 1990's Alternative Rock and the unassuming Madison, Wisconsin recording studio at its center. If you’ve ever been touched by the music of Nirvana, Smashing Pumpkins, Garbage, L7 or their peers, you’ve been touched by the music created at Smart Studios, the legendary recording facility founded by Butch Vig and Steve Marker. The Karma Kicks are a band from St. Paul, MN. So go on and get your kicks, just remember that the Karma Kicks back. Formed in early 2012, kickin' it since 2002, still jammin' and recording, playing live as often as they can. Next we have The Person & The People, a group of old friends from multiple bands in the area that finally teamed up and joined together to make music. The result of that is a power-pop flavored rock and roll band that truly stands out from the rest. That youthful energy can certainly still be felt with this band. Lastly but not least is Wide Times! Be sure to check them out. The Austin, TX singer songwriter has made a habit of defying expectations and he’s quite comfortable stepping outside of the guy-with-a-guitar trappings of the genre. The theme of resilience plays a central role throughout his most recent album, Windfall. After the toll of four years of straight touring, he was ready to call it quits in 2013. He managed to perserve through embracing the back to basics approach to writing new muic. Windfall was released on March 10, 2015 on Lightning Rod Records in the US and Loose Music in Europe. Amanda Shires began her career as a teenager playing fiddle with the Texas Playboys. Since then, she’s toured and recorded with John Prine, Billy Joe Shaver, Todd Snider, Justin Townes Earle, Shovels & Rope, and most recently her husband Jason Isbell. Along the way she’s made three solo albums, each serving to document a particular period in her life while improving on the perceptive qualities of the previous record. The songs on her newest album, My Piece Of Land, deal with family, with anxiety, with the phases of one young woman’s life; but the primary focus of My Piece Of Land is the concept of home. 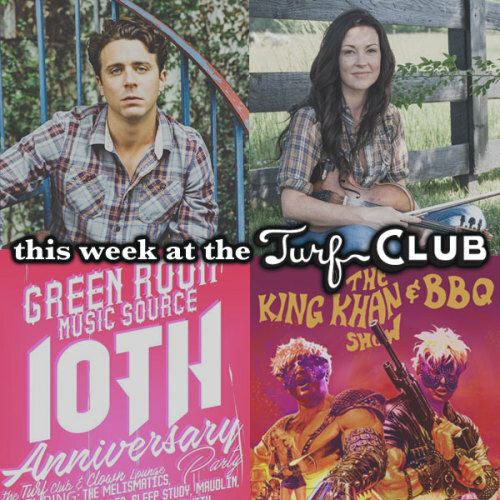 Come and help Green Room Music Source celebrate their 10th anniversary this Saturday at the Turf Club (and downstairs in Clown Lounge). Green Room has worked with many great artists and have invited some of them to share the stage including The Melismatics, Ruby Isle (reunion show), Gaelynn Lea, Sleep Study, Maudlin, The Look and The Feel, Savanah Smith, Martin Devaney, Dan Israel, Johnny and Molly of Communist Daughter, DJ Mark Mallman, Brooke Elizabeth. Hosted by Timmy Williams of The Whitest Kids 'U Know! Come raise your glass with us! It's been a great ten years!